Would you like to harvest consumer insights from social media? New tools, based on artificial intelligence technology, can analyze enormous amounts of social media data and find insights from the copy and imagery of billions of social media posts. Crimson Hexagon is a company offering such a solution. 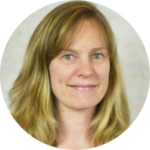 I got to interview Jane Zupan, Senior Director of Product Marketing at Crimson Hexagon. She has a M.S. in Computer Science and nearly 20 years of experience in the high-tech space. She started her career as a software developer, working for a French company that developed undersea routers for high speed optical networks, back in the days before Google was a verb. She moved into a product marketing role in 2006 and has been in marketing since. She’s worked with both enterprise software vendors and start-ups, and has focused on data, analytics and AI technologies since 2015. Crimson Hexagon was founded in 2007 by Gary King, the Albert J. Weatherhead III University Professor — one of 24 with Harvard University’s most distinguished faculty title — and Director of the Institute for Quantitative Social Science. Initially, Gary and his team were looking for a statistical method to measure the causes of death in developing countries where accurate medical records are not available. They developed a method to survey relatives and neighbours of the deceased about the disease symptoms. Based on that information and similar surveys collected from medical professionals, they arrived at a statistical correlation for the causes of death. The next step was to apply the same mathematics to the political science field. In 2007, ahead of the U.S. presidential election of 2008, they used the same methods to analyse public online generated content, such as blog posts. They found that same mathematical models that were used for disease systems could be applied to blog posts to measure sentiment about political candidates. The product that would become the Crimson Hexagon Platform was developed by applying the same ideas to more broad business use cases and integrating public online content from the burgeoning world of social media. Since then, Crimson Hexagon has vastly expanded the amount of data, the breadth of sources, and the sophistication and quality of analysis. What Problem Does Crimson Hexagon Solve? Crimson Hexagon’s consumer insights platform allows clients to understand audiences, track brand perception and campaign performance, and detect competitive and market trends by analysing the world’s largest volume of unstructured text and images across social, online public, and enterprise-held data sources. What Does Crimson Hexagon do, and why is it Important to Your Customers? Crimson Hexagon offers a SaaS platform for analysing large scale consumer conversations so clients can build a more complete view of the customer. The primary use cases are audience analysis, brand analysis, campaign analysis, competitive intelligence, and industry and trend analysis. Data inputs for these broad consumer conversations include public online social media (e.g. Twitter, Reddit, Facebook, etc. ), enterprise-held data (e.g. ratings and reviews, support tickets, call transcripts), and other public online data (e.g. Bloomberg, Yahoo Finance). Consider an example in the area of brand analysis. Most large B2C enterprises track brand health and develop initiatives to influence brand perception. 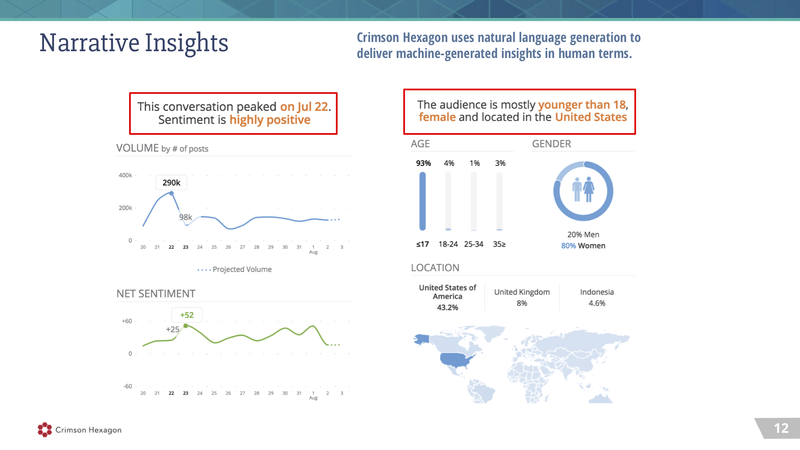 Crimson Hexagon helps clients by continually monitoring public online conversations and sending alerts if there is an anomaly in the typical pattern, such as a sudden shift in the volume of conversation around the brand, or a change in the general sentiment, such as a spike in anger or joy. The user can drill down deeper to determine the cause of the anomaly or the shift, and better understand the perceptions and motivations for their audience. In order to derive insights from unstructured data at scale, Crimson Hexagon uses Artificial Intelligence technologies. While AI technologies work behind the scenes, they enable some very powerful capabilities. By identifying patterns at a scale beyond human capacity, these AI technologies are able to surface insights that would not otherwise be available. By automating the delivery of the insights that are most relevant to a particular user, AI makes the insights actionable. In the brand analysis example, users have immediate access to the analytics that triggered the event, so they can make data-driven decisions. With a blend of human expertise and artificial intelligence, the subject matter experts can frame the research in their terms, while the machine runs the analysis at scale. More training data, so the self-learning algorithms continually improve, leading to more accurate and more granular insights. The unique ability to build year-over-year and historical comparisons. The breadth of data means the analyses can go deep, to surface both broad trends and nuanced information. It has become increasingly important to understand image a source of unstructured data. When consumers communicate with images on social media sites, they typically don’t tag brands, but there are valuable insights within the information, when aggregated at scale. The ability to analyze this valuable source of unsolicited information can offer powerful insights into consumer perceptions. The Crimson Hexagon Platform imitates the way the eye processes visual content using neural networks and deep learning algorithms. Beyond logo recognition, the technology also identifies objects, scenes, facial expressions, and actions. It’s also important to note that the Crimson Hexagon Platform offers a unified analysis of both image and text content. Natural online conversations are a combination of both image and text, and the most valuable insights come from looking at the data holistically. Other vendors don’t offer this unified analysis. Crimson Hexagon users cover a broad spectrum of analysis consumers and analysis creators, ranging from a business executive to a market researcher to a customer insights analyst. The Crimson Hexagon Platform offers a role-based experience, adapted to each type of user: from dashboards and reports for the executive, to quick & easy insights for the marketer, to deep-dive analytics capabilities for the analyst. How Does Crimson Hexagon use AI? Machine learning, for detecting patterns and automating the classification of attributes, at a very large scale. 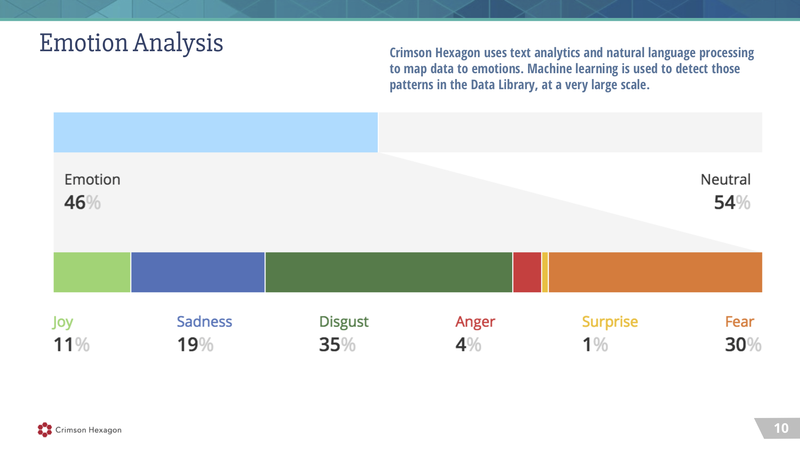 With these algorithms, Crimson Hexagon classifies attributes such as emotion, sentiment, topics, audience demographics, and much more. Neural networks and deep learning: These are part of the family of machine learning methods. 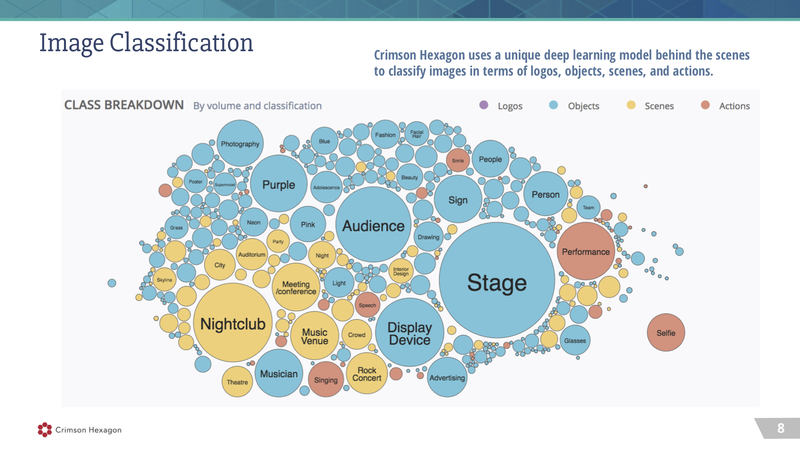 They enable Crimson Hexagon to identify logos, scenes, actions, and objects in image-based content. Network analysis is used for giving a detailed understanding of an audience’s interests, by mapping attributes and connections to correlate audience groups with topics, sentiment, and affinities. The future of AI in business and marketing is about helping people make better decisions from vast amounts of information. With the evolution of analytics and business intelligence in the recent past, vast amounts of data are available. 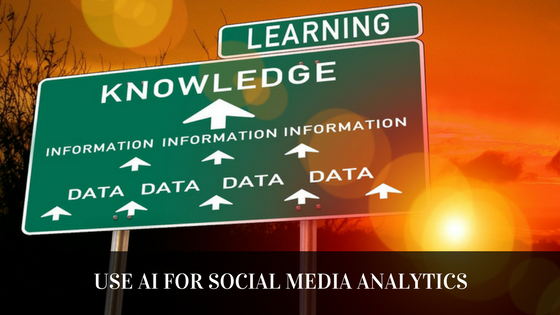 Artificial Intelligence in this context offers the ability to sort through the data, deliver actionable insights, and offer recommendations for relevant content. Without AI, this information is overwhelming. 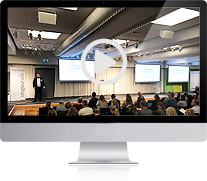 The implications of making data-driven decisions on how best to target your audience and how to steer brand perception are enormous. Taken a step further, the ability to track the progress of campaigns that support your initiatives and understand how they have an impact on the conversations around your brand, is quite powerful. We are just scratching the surface of the possible with AI, but the end goal is not about replacing roles or automating the tasks of marketers. From our perspective, the goal is to surface insights from large volumes of data in a way that would otherwise be impossible. 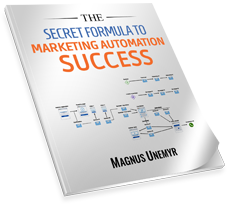 Marketers have enormous amounts of data at their fingertips, and this makes their jobs more complex. AI is needed just to help them help them navigate the landscape of more complex, targeted and real-time data streams. The automation aspect of AI is to offer the insights that are most relevant before the user knows to ask the question. For example, if you are interested in tracking your brand mentions, you’ll probably want to know immediately if there is a sudden spike in the volume of conversation around your brand, or if there is a sudden change in sentiment, say a spike in anger in the conversation around your brand. Without AI technology, this information would come too late, if it all. In other words, we’re not replacing people with the AI technology. We’re delivering insights that you would not have access to before. These are golden days for marketing. 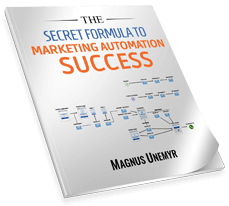 The holy grail for marketing has always been to better understand and connect with the customer. In the non-digital past, market research primarily centered on surveys and focus groups. These methods are still used today, but they have limits of scale. There is also a potential for survey bias when actively soliciting information. Another limit is the temporal aspect: not being able to get that data historically, or in real time. The new age of digital offers limitless possibilities for a data-centric approach to market research and customer insights. The ability to tap into large scale unsolicited consumer conversations for insights has huge implications in terms of understanding the customer, the competitors, and the broader marketplace. These are undeniably good times for marketers. In this interview, Jane Zupan provided fascinating insights into how artificial intelligence can be used to harvest vast oceans of social media data for consumer insights. 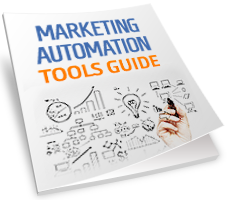 Social media marketers certainly have powerful tools at their disposal these days!